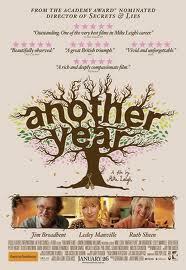 Mike Leigh’s most recent film split my friends – you can read a lengthy and less than enthusiastic review of Another Year here, but others really enjoyed it and I have to say that I found it to be a warm, perceptive and affecting drama that fits in perfectly to his work in the 2000s. Initially it seems to come from the same mould as Happy Go Lucky as we focus on engineer Tom and therapist Gerri, a long-married couple who are still deeply affectionate for each other and appear to live lives untroubled by major concerns and more than happy with their lot. Ruth Sheen and Jim Broadbent fit together beautifully, their affability shining through as they tend to their beloved allotment or entertain their son Joe, Oliver Maltman in a seemingly permanent flirtatious mood. But it seems that happiness is something of a lottery and as we progress through the four acts of the film, taking place over the seasons of a year, we see that the lives of the people living around this couple are substantially less than idyllic. Whether it is Gerri’s client, a devastatingly pinched Imelda Staunton; Tom’s old pal Ken who has hit the booze and pies incredibly hard, Peter Wight in great desperate bedraggled form; David Bradley’s shell-shocked Ronnie, Tom’s brother with a tearaway nightmare of a son, Martin Savage crackling with vicious energy, it seem that happiness has passed them all by. But chief amongst them all is Lesley Manville’s Mary, Gerri’s workmate whose loneliness is nearly crippling. From the moment we see her, the hints of desperation are there, no apparently single man is safe from her gaze and yet she seems destined to fail. The handsome man at the bar is waiting for a date, her long-standing crush on Joe doomed by the eventual arrival of a girlfriend on the scene, even a late attempt to connect with Ronnie is scuppered. The one chance she gets is with Ken which leads to a horrendously charged, awkward scene on a bench at a barbeque, overladen with such desperate sadness. The company for this film is a little smaller than Leigh’s others, relying more on his regulars, but there’s still the usual standard of impeccable performance: Bradley and Savage as father and son are outstanding, Karina Fernandez as Joe’s girlfriend perhaps feels a little too stylistically close to Sally Hawkins’ Poppy but I still loved it and Stuart McQuarrie pops up briefly in here too. I really like Another Year, though it would probably rank third of four out of the 2000s Leigh films in the end, not carrying much weight of expectation with me meant that there was little opportunity for me to be disappointed by it first time round. And rewatching it as part of this series was a great pleasure in terms of seeing another iteration of the ensemble and the extraordinary character work that he encourages from his actors. One could argue that not much happens and that we’re not allowed much deviation from the characters as they are initially presented to us, but to my mind that is true of much of his work and just means that if you buy into this world that is created here, then it will work beautifully for you. If not then it won’t, as happened with me for Grief.